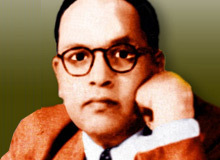 Dr B R Ambedkar, popularly known as Babasaheb Ambedkar, was one of the architects of the Indian Constitution. He was a well-known politician and an eminent jurist. Ambedkar's efforts to eradicate the social evils like untouchablity and caste restrictions were remarkable. The leader, throughout his life, fought for the rights of the dalits and other socially backward classes. Ambedkar was appointed as the nation's first Law Minister in the Cabinet of Jawaharlal Nehru. He was posthumously awarded the Bharat Ratna, India's highest civilian honor in 1990. Bhimrao Ambedkar was born to Bhimabai Sakpal and Ramji on 14 April 1891 in Madhya Pradesh. He was the fourteenth child of his parents. Ambedkar;s father was a Subedar in the Indian Army and posted at Mhow cantonment, MP. After the retirement of his father in 1894, the family moved to satara. Shortly after, his mother passed away. Four years later, his father remarried and the family shifted to Bombay, where he cleared his matriculation in 1908. His father Bhimabai Sakpal died in Bombay, in 1912. Ambedkar was a victim of caste discrimination. His parents hailed from the Hindu Mahar caste, which was viewed as "untouchable" by the upper class. Due to this, Ambedkar had to face severe discriminations from every corners of the society. a The discrimination and humiliation haunted Ambedkar even at the Army school, run by British government. Fearing social outcry, the teachers would segregate the students of lower class from that of Brahmins and other upper classes. The untouchable students were often asked by the teacher to sit outside the class. After shifting to Satara, he was admitted to a local school but the change of school did not change the fate of young Bhimrao. Discrimination followed wherever he went. In 1908, Ambedkar got the opportunity to study at the Elphinstone College. Besides clearing all the exams successfully Ambedkar also obtained a scholarship of twenty five rupees a month from the Gayakwad ruler of Baroda, Sahyaji Rao III. Political Science and Economics were the subjects in which he graduated from the Bombay University in 1912. Ambedkar decided to use the money for higher studies in the USA. After coming back from the US, Ambedkar was appointed as the Defence secretary to the King of Baroda. Even, there also he had to face the humiliation for being an 'Untouchable'. With the help of the former Bombay Governor Lord Sydenham, Ambedkar obtained the job as a professor of political economy at the Sydenham College of Commerce and Economics in Bombay. In order to continue his further studies, in 1920 he went to England at his own expenses. There he was awarded honor of D.Sc by the London University. Ambedkar also spent few months at the University of Bonn, Germany, to study economics. On 8 June, 1927, he was awarded a Doctorate by the University of Columbia. After returning to India, Bhimrao Ambedkar decided to fight against the caste discrimination that almost fragmented the nation. Ambedkar opined that there should be separate electoral system for the Untouchables and lower caste people. He also favored the concept of providing reservations for Dalits and other religious communities. Ambedkar began to find ways to reach to the people and make them understand the drawbacks of the prevailing social evils. He launched a newspaper called "Mooknayaka" (leader of the silent). It was believed that, one day, after hearing his speech at a rally, Shahu IV, an influential ruler of Kolhapur dined with the leader. The incident also created a huge uproar in the socio-political arena of the country. In 1936, Ambedkar founded the Independent Labor Party. In the 1937 elections to the Central Legislative Assembly his party won 15 seats. Ambedkar oversaw the transformation of his political party into the All India Scheduled Castes Federation, although it performed poorly in the elections held in 1946 for the Constituent Assembly of India. Ambedkar objected to the decision of Congress and Mahatma Gandhi to call the untouchable community as Harijans. He would say that even the members of untouchable community are same as the other members of the society. Ambedkar was appointed on the Defence Advisory Committee and the Viceroy's Executive Council as Minister for Labor. His reputation as a scholar led to his appointment as free India's first, Law Minister and chairman of the committee responsible to draft a constitution. 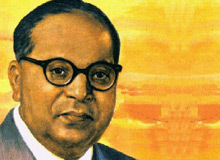 Bhimrao Ambedkar was appointed as the chairman of the constitution drafting committee. He was also a noted scholar and eminent jurist. Ambedkar emphasized on the construction of a virtual bridge between the classes of the society. According to him, it would be difficult to maintain the unity of the country if the difference among the classes were not met. In 1950, Ambedkar traveled to Sri Lanka to attend a convention of Buddhist scholars and monks. After his return he decided to write a book on Buddhism and soon, converted himself to Buddhism. In his speeches, Ambedkar lambasted the Hindu rituals and caste division. Ambedkar founded the Bharatiya Bauddha Mahasabha In 1955. His book "The Buddha and His Dhamma" was published posthumously. On October 14, 1956 Ambedkar organized a public ceremony to convert around five lakh of his supporters into Buddhism. Ambedkar traveled to Kathmandu to attend the Fourth World Buddhist Conference. He completed his final manuscript, "The Buddha or Karl Marx" on December 2, 1956. Since 1954-55 Ambedkar was suffering from serious health problems including diabetes and weak eyesight. On 6 December, 1956 he died at his home in Delhi. Since, Ambedkar adopted the Buddhism as his religion, a Buddhist-style cremation was organized for him. The ceremony was attended by hundreds of thousands of supporters, activists and admirers.